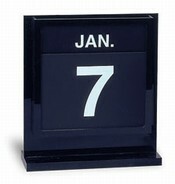 Even from a distance, the dates on these wall mounted perpetual calendars are easy to see. The attractive holder is crafted from glossy black acrylic with highly polished edges. The inserts are easy-to-clean Polystyrene with screen printed copy. Your choice of black inserts with white copy, or white inserts with black copy.